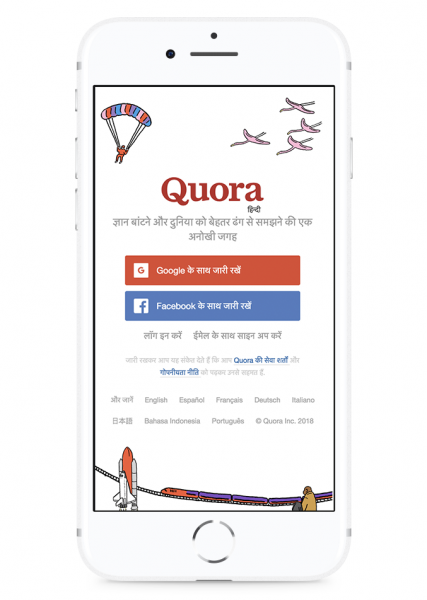 Q&A platform Quora announced today the launch of Quora in Hindi. Launched in English in 2010, the platform has grown to reach more than 200 million unique visitors per month from around the world acrosss eight languages. More than half the people who use Quora come from outside the United States, including many people from India as stated by the company. In April this year, Quora launched a beta version in Hindi to a small group of people. In just a few months, the platform has grown with quality content provided by personalities from different sectors such as doctors, development professionals, IAS officers, software developers, CEOs, writers, graphic designers, and teachers. On Quora, people can ask questions about any topic. Quora then distributes those questions to those who can provide high quality and useful answers, based on their relevant expertise and experiences. Quora is able to provide good answers to questions based on the quality of writers on the platform, feedback writers get from others in the community, and product features that ensure credibility. Also, there is a policy of using your real name on Quora, which increases the level of integrity and trust people have in the answers. Identities on Quora are an extension of who people are in the real world. Quora also has a “Be Nice, Be Respectful” policy that requires a minimum level of civility when using Quora. Quora uses technology—machine learning, natural language processing, and pattern-matching—to detect and remove things that make your experience worse, like spam, plagiarism, and trolling. Since its launch, Quora has attracted leading personalities and experts who have answered all kinds of questions asked by people on Quora, and shared knowledge that wasn’t available before. People like former US President Barack Obama, Indian Railway Minister Piyush Goyal, Flipkart Co-Founder Sachin Bansal, Wikipedia founder Jimmy Wales, and social sector expert Smarinita Shetty are just a few examples. “Quora has been popular in India for many years, and now that we are opening Quora up in Hindi we hope to have even more participation from people in India. I’ve been excited to see the engagement throughout the beta of Quora in Hindi. The universal appeal of our mission combined with India’s diversity and large base of internet users makes the launch of Quora in Hindi an important step towards expanding access to knowledge,” said Gautam Shewakramani, India Country Manager at Quora. You can register at https://hi.quora.com or download the Quora mobile app.